Do you use work trucks in your business to deliver products, perform particular tasks for clients, or transport employees to and from your office? If so, you shouldn’t miss this opportunity to market your business through your commercial vehicles. Using custom truck wraps can be just what you need to promote your products or service while on the road. With truck wraps and graphics, you can take your branding with you anywhere you go. This means a lot for your brand visibility as anyone on the streets can see your business name, logo, and marketing message. Just imagine the impact on your business if you have a fleet of branded trucks, all spreading your message and building brand recognition. What’s more, these custom truck wraps show both existing and potential clients that you’re a professional business they can trust. Call Liberty Signs, Inc today at (864) 210-1115 for a Free Consultation with a Truck Wrap Expert! If you’re like the average joe, then you probably travel the same route every single day. You are no more than just another car on the road, blending in with the countless other vehicles around you. But can you imagine how your vehicle would stand out if you use a custom truck wrap by Liberty Signs, Inc? As if by magic, you get more calls from potential customers, more strangers approaching you, and more people recognizing your brand. 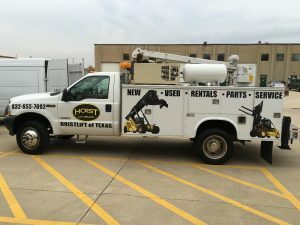 This is all made possible by the unparalleled visibility afforded by custom truck wraps, allowing your business to have a consistent branding effort. If your trucks take the same route every day, this means that the same local demographic sees your truck every single day as well. 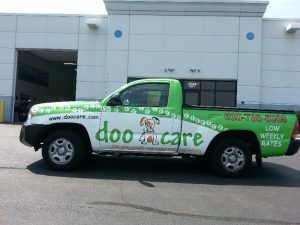 With a custom truck wrap, there’s a good chance that the other cars on the road will become familiar with your brand. Before you know it, you now have more prospective local customers without doing anything else. These wraps and graphics turn your vehicles into marketing machines, ensuring that potential customers always see what you have to offer through beautiful designs and compelling messages. We understand that each business has different needs and a unique message they want to get across to customers. The custom wrap must provide something of real value while being eye-catching at the same time. We take the time to include attractive design elements to engage the attention of potential customers. The wrap is also designed in a way to guarantee that your message will be seen even from a distance. The layout of your truck will also be factored in to ensure that the wrap looks perfect. We have a team of experienced and highly-skilled truck wrap designers who can sit down with you to determine what product suits you best. 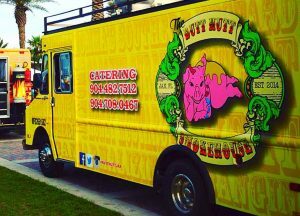 Whether you need truck wraps, graphics, or magnets, we surely got you covered! If your business uses different types of vehicles to execute a variety of functions, then we can create wraps for them as well. It doesn’t matter whether you use an RV or an ATV. You can rely on our expertise to create unique wraps for your vehicles. We specialize in creating a cohesive design, one that fits any type of vehicle perfectly. This can be the solution you’ve been looking for to boost the consistency of your brand marketing campaign. 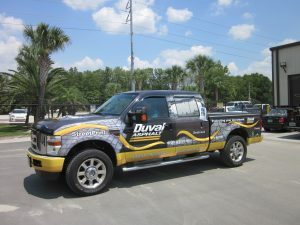 Many think of truck wraps as just a marketing tool. However, they also double as a form of protection for your vehicle. Made from a durable vinyl film, this material provides a layer of protection to preserve your vehicle’s paint job and shield it from road wear and weathering. As you know, vehicles are one of the biggest investments you can make for your business, so it only makes sense to take steps toward improving their lifespan and value. 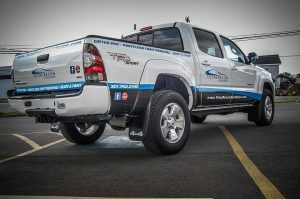 In order to provide the kind of protection you’re looking for, the truck wraps must be installed properly. We have a team of professional installers who take care of the whole process from prepping to finishing. Our streamlined approach ensures that the finished product is one you’ll feel so proud to have on your trucks. The truck wrap process isn’t as straightforward as you’d imagine, but we will be with you in every step. Our team of expert designers, manufacturers, and installers will guide you as you pick the right design and material for your vehicles. Not only can you expect your trucks to be more attractive after the wrapping, but they will also enjoy an increased lifespan. Are your existing wraps damaged already? We can make your vehicle look like new again, whether the wrapping was done by us or not. Allow us to work with you in protecting your investment, boosting brand visibility, and generating new customers through our durable, attractive, and high-quality truck wraps! Liberty Signs, Inc is always ready to listen to your needs, so feel free to talk with us regarding your truck wrapping needs.